Patellofemoral pain syndrome is painful rubbing of the kneecap against the thigh bone. This pain occurs during exercise or movement. It is most common during impact actions such as running. 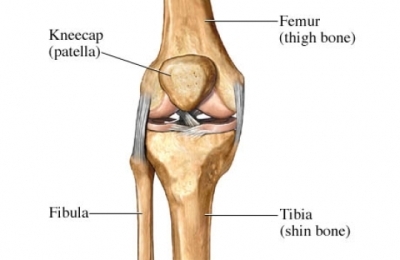 Swelling in the tissue around the kneecap causes the pain. It is often the result of overuse and improper use of the legs. The first symptom is pain around or under the kneecap. The pain may first appear during high-impact activities. Over time, the pain may appear with squatting, kneeling, or long periods of sitting. Pain is often increased by going down stairs or down hills. Your doctor will ask you about your symptoms and health history. You will also have a physical exam. The diagnosis is often made based on the exam and your symptoms. The doctor may also suggest images of your knee. These tests may help to rule out other problems. Your doctor may refer you to a specialist. The first step is to rest the knee. Look for low impact exercise options. For example, choose swimming instead of running. Your doctor may suggest that you apply ice to the kneecap after activity. A physical therapist will look for issues that may cause the pain. The findings will help to create a treatment plan. Part of the plan may include an exercise program. Increasing the strength of the muscles around the knee can help. Over-the-counter medicine can help to manage pain. Knee braces or knee sleeves may help some people. They may help to hold the kneecap in place during activity. Some are designed to stop the patella from going too far to the side. You may need to try a couple to see which works best for you. Special shoe inserts, called orthotics, may also be helpful. They work best if there are foot problems such as flat feet or excessive turning in during walking. The goal of surgery is to better align the kneecap. It may be an option if other treatments did not help. Warm-up before you start an exercise. Vary the types of activities that you do. For example, rather than run every day, switch between running and swimming. Use the right shoes for your sport. Slowly increase the amount and intensity of activity over time. Take care of injuries right away. This includes getting first aid. Rest the injury until it is healed before starting again. If you have knee or joint pain during activity, call your doctor. Clijsen R, Fuchs J, Taeymans J. Effectiveness of exercise therapy in treatments of patients with patellofemoral pain syndrome: a systematic review and meta-analysis. Phys Ther 2014;94(12):1-11. Kooiker L, Van De Port IGL, Weir A, Moen MH. Effects of physical-therapist guided quadriceps strengthening exercises for the treatment of patellofemoral pain syndrome: a systematic review. J Ortho Sports Phys Ther 2014;44(6):391-B1. Patellofemoral pain syndrome. Am Fam Physician. 1999 Nov 1;60(7):2019-2022. Available at: http://www.aafp.org/afp/991101ap/991101b.html. Accessed March 27, 2018. Smith TO, Drew BT, Meek TH, Clark AB. Knee orthoses for treating patellofemoral pain syndrome. Cochrane Database of Syst Rev 2015;(12):CD010513. 1/24/2011 DynaMed Plus Systematic Literature Surveillance https://www.dynamed.com/topics/dmp~AN~T116002/Patellofemoral-pain-syndrome : Fukuda TY, Rossetto FM, Magalhães E, Bryk FF, Lucareli PR, de Almeida Aparecida Carvalho N. Short-term effects of hip abductors and lateral rotators strengthening in females with patellofemoral pain syndrome: a randomized controlled clinical trial. J Orthop Sports Phys Ther. 2010;40(11):736-742.